The Truth About Basically Everything: It's time... for the hottest party! Sorry you haven't heard much from me lately. My very extremely lovely Internet has been down all week. I feel like I have broken leg or something. It's so debilitating. (I can't believe I spelled that word right on the first try. Yessss.) Also, I have a new hobby/addiction. 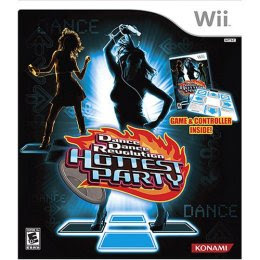 It's Dance Dance Revolution for the Wii. I got it for Christmas, but I really only started playing it about a week ago... and I haven't done much else since. I'll be honest. I've quit going to aerobics. I really love this game and it is one of the few workouts that I can't get enough of. I have two mats, so please, join me for the hottest party. I promise you will love me for it, once you can walk again. I spent about 2 days last week where I could barely go up or down stairs because my calves were so sore. I mean, I'm not saying I'm like awesome at it or anything, but well, I can hold my own. Not really, but I still love it. So please come over and play with me. At least try. You owe it to yourself. That sounds like fun. I have another friend who is totally addicted to it. I'll have to give it a try sometime. Ben and I are addicted to guitar hero right now - probably just as fun, but there's no exercise involved. Rock on!! If you will refer back to my 100 you will remember that I dance like a 92 yo woman so I might just have to watch you work it out, but it sounds way fun. I wish I would have seen you in Target, I was probably totally zoned or something. I take Target really seriously!!! Glad your back and recovering from internet loss - we missed you. I can NOT dance, I have been blessed with ZERO coordination. Like Lindsay, I have no coordination. My sister got that a couple years ago and she loves it. I'd send her over to your house to match up with you but I'm not very good at it either. My sister says it's fun and it's funnier to watch the guys try to do it. hehe It looks like a good workout though, and fun too. Keep going! I'm glad your back. It was fun seeing you at Target the other night! Your little girl is so very cute. I know how it is to carry the car seat everywhere. I remember with Daxton pushing the stroller and holding the car seat. Not very fun! I hear this is a way fun game, but have never tried it. I would look like a crippled giraffe, I'm sure! Have a great day! I kept checking your blog and wondered if you were okay! I'm a dork I should have just called you! Glad you are up and "dancing" :-) Wade bought us guitar hero for our Wii, we'll you know what I would type next. Addictive!!!! Have fun! I would totally come & play with you if I lived closer. I have heard about this game & I have been wanting to play it. You are so funny "join me for the hottest party"! Seriously, you crack me up! Bring it to Kansas when you come! :) It sounds like so much fun....LOVE! You are so funny! I showed Alan your blog because Bailie keep on saying that she going to save her money and buy a Wii alan told her she would be saving up for a long time. I told him we needed one just to stay into shape since the last time we played neather one of us could move. Stacy said she lost like 10 lbs or something when she was doing her dance pad. The only reason I wanted a WII was for a workout. I may have to drop by sometime and show you some of my sweet moves. Oh, I need this for our Wii. I could use the exercise. I usually work on my computer while Tom and the kids play. Boxing looks like a great workout too. I am so in!! As long as not expectations are held, I may be a dance teacher, but, without technique and choriography, I am lost!? But I am not scared to look like a dork!